Features: The Beverly 3N1 USB cable can be used with most smartphones or tablets and provides both charging and data transfer options. TPE covered 2A cable, ABS head with magnetic lock and split ring to attach to your keys so you have a cable on you all the time. 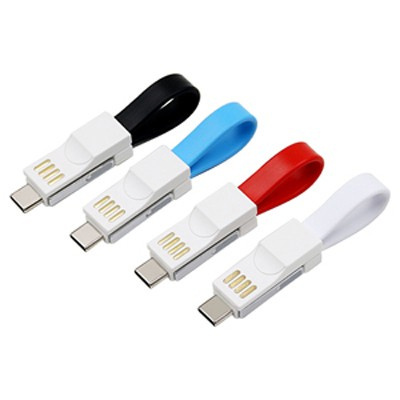 Includes combined micro USB, 8Pin and Type-C connectors. Material: ABS, TPE.. Certification: CE. Product Colour: Black, Blue (light), Red, White, Orange, Lime Green. Product Size: 40 x 19 x 14 mm, 90 cm (lanyard cable) . Print Area: 8 x 10 mm (1), 38 x 4.5 mm (2), 14.5 x 6 mm (3), 10 x 6.5 mm (4). Print Process: Pad Print. Delivery: 2-4 weeks (indent) from art approval. Standard Packaging: PE Bag. Packing Details: 1000 pcs per carton, 14 Kgs, 38x32x28 cms. Setups: Included.